Short termers do best when they listen and learn on their trips. Listen to this talk by Greg R. Taylor, preparing short term missionaries spiritually, emotionally, and physically for upcoming short term mission trips! Get Greg’s book, How to get ready for short term missions at the Amazon link on this page. Can I drink the water? But I don't speak the language. You want me to sleep where? They eat what? How am I going to raise that much money? Is it really God's will for me to go? I don't know how to share the gospel. Are you ready? How to Get Ready for Short-Term Missions will help you: Pack your suitcase and prepare your heart; Build genuine relationships with the locals; Understand cultural differences; Deal with physical fatigue; Combat stretched emotions. With humor and experience, Anne-Geri' and Greg ask questions you can't hide from and help you focus on your true mission. Get the only packing list you really need for short term missions below. An excerpt from Greg’s book co-authored with Anne-Geri’ Fann. Greg adapted the list from his friend and former mission teammate, Sara Barton, who would hand out such a list to interns in Jinja, Uganda in the 1990s when they were doing church planting in the Soga region. This region is now the site of The Kibo Group ministry. A towel (humility): For remembering to graciously accept hospitality. A broken watch (deliberateness): So I won’t be in a hurry all the time, particularly when I’m talking to people. My Bible (transformation): To discipline myself to read daily from God’s Word, memorize passages, and grow like Jesus—in wisdom, stature, favor with God, and favor with humans. Crayons (creativity): So I won’t sit around waiting to be entertained. Journal (discernment): To keep a record of the incredible things I see and hear. Magnifying glass (healthy curiosity): For asking questions about things I’m uncomfortable with or don’t fully understand, especially how or why a missionary is doing something. So I’ll take an interest in my surroundings and enjoy the differences I observe. A mirror (respect): As a reminder to heed my appearance and conduct (e.g., what I wear, who I talk to, and who I can touch or hug). My brain (sensibility): So I won’t try to “straighten out” a national but instead listen and give scriptural advice. To help me remember that if I need assistance, I should ask one of the missionaries for help. My heart (friendliness): So I can shake hands with the people I meet (or whatever is the appropriate greeting for my area). An open mouth (consideration): For carrying on conversations with nationals, not just the people in my group. A closed mouth (follow-through): So I won’t make promises unless I’m able to deliver (e.g., sending pictures, Bibles, money, or other promises I might later find difficult to keep). A raincoat (patience): As a reminder not to display anger or impatience when unexpected things happen, especially if it could repel people and damage the cause of Christ. Shoes (pro-activity): For helping me think of things to do and help. Trowel (participation): So I’ll get involved in activities with people in my area, be it gardening, cooking, or sports. A water bottle (partnership): So I’ll work well with the missionaries, sharing frustrations and triumphs during our time together. Work gloves (usefulness): So that I can “become all things to all men so that by all possible means I might save some. I do all this for the sake of the gospel, that I may share in its blessings” (1 Corinthians 9:22–23, NIV). “Short Term Missions Packing List” adapted from Sara Barton’s list for Jinja Internship by Greg Taylor and Anne-Geri’ Fann. 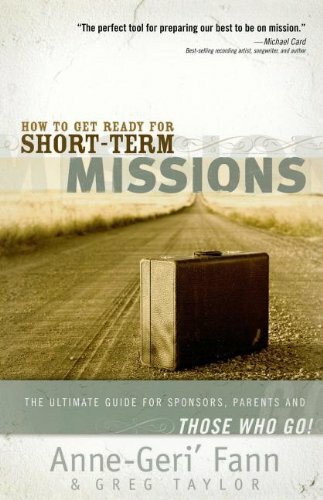 This list and much more about Short Term Missions in Taylor’s and Fann’s book. Greg Taylor is the preacher for The Journey. Greg is married to Jill, who is a math teacher at Broken Arrow High School. They have three adult children, Ashley, Anna, and Jacob, and of course they are very happy about what God has done in each of their lives. He holds degrees in Print Journalism from Harding University and a Master of Divinity from Harding School of Theology. Greg is working on his Doctor of Ministry at Phillips Theological Seminary in Tulsa, Oklahoma, where The Journey is located. Greg is author of books you can order here at The Journey Gear Store.